Clever solutions for decluttering your space. Between all the toiletries, beauty products, and miscellaneous odds and ends that make up the contents of our bathrooms, these utilitarian rooms can challenge even the most organized person’s ability to stay neat. But thanks to a few space-saving tricks and clever solutions, your bathroom could feel more spa-like than sporadic. Here, we’ve rounded up some of the best organization solutions for keeping your bathroom—no matter how big or small—both stylish and clutter free. Forget those go-to unsightly plastic bins, basic baskets, and not-so-pretty door organizers, and instead opt for smart space solutions and accessories that maximize what you have and give all those bathroom items a rightful home. Once all your products are organized and accounted for, your bathroom will finally be the peaceful oasis you always wanted. You’ve heard time and time again that using vertical space is key for squeezing in extra storage in a small room – it’s no different in a tiny bathroom. But don’t just hang a few shelves on any spare part of the wall and call it a day. Give your bathroom a more polished look by incorporating shelves that run the length of a wall. Alternatively, you may tuck the shelves into a nook, which helps them blend in better, like an architectural element rather than something jutting out of the wall. Instead of tossing your stuff into a vanity drawer, here’s a clever solution to bring order to beauty product mayhem. Upcycle old containers, like paint or soup cans, and use them as drawer organizers to store combs, brushes, and hair tools – upright, not one on top of the other. The cans withstand heat so you don’t have to worry when you put hot tools away. If you do your makeup in front of the bathroom mirror and have limited countertop space, keep your go-to products within arms reach by swapping out your run-of-the-mill mirror for something with easy-to-access storage, like this one’s subtle shelf or one with a barely-there ledge. Open-shelf bathroom vanities start off pretty and organized, but they’re easy to make a mess of when the day-to-day reality sets in. That’s why containers are a no-brainer when it comes to keeping this spot clutter-free. Make sure to use storage baskets in the same style or in a consistent color scheme to give order to the room and prevent it from looking busy. Love minimalist design, but still need functionable storage? This slatted storage rack is the perfect addition to your bathroom. What’s actually an IKEA bed base finds a home in the bathroom when hung up with polished chrome wall hooks and S hooks. The streamlined look better complements a pared down aesthetic, but is just as practical as open shelves. Magnets help corral smaller items, like tweezers, bobby pins, and nail clippers. Or, take things up a notch and use magnetic spice jars to hold hair ties, hooks to hang an eyelash curler and scissors, or even mount a small container to the door to hold bigger items. Get a hold of those unruly hot tool cords once and for all by setting up a storage spot to neatly hang your hairdryer, curling iron, and whatever else is part of your daily routine. Whether you simply add hooks to the back of a cabinet door, hang a cubby to the side of your vanity, or retrofit a drawer into a salon-approved holder, maintaining these products prevents a jumbled mess in your vanity, which frees up much-needed space for other essentials. A freestanding ladder is an instant storage solution for renters if your landlord won’t allow you to put holes in the walls. Drape washcloths on the rungs for a stylish space-saving display, or opt for a ladder with shelves on each level if you need more room for fluffy towels and toiletries. Stock it with a basket or two to help add dimension to the room. No vanity, no problem. Sure, it’s hard not having an enclosed spot to hide your bathroom supplies, but think of it this way: this just gives you more incentive to keep things tidy since everything’s on display. Elegant woven baskets, beautiful tiered wire shelves, or even a rustic step stool provides spots to stash frequently used items. Say goodbye to the hassle of trying to get something from the deep, dark back corners of your bathroom cabinet. With roll-out trays, you can clearly see and get to all your toiletries without the annoying take-everything-out-because-I-can’t-find-what-I’m-looking-for step. A two-tiered stand provides even more room while organizing containers placed on the tray keeps like items together. When space is at a premium, don’t forget about the wasted corners of your bathroom to maximize its storage potential. Mount floating shelves to the wall near your sink for soaps and lotions. Instead of letting your good-looking products hideaway under the sink, display them out in the open to glam up your bathroom—and free up space for unattractive items like toilet paper and cleaning products. Put down a tray and show off nicely-packaged lotions, candles, perfumes, and diffusers for a seriously chic, yet useful touch. Another way to utilize the space above your toilet? Add a shelf that floats right on top of it that elevates the space with an extra dose of character. If your big bottles of shampoo and body wash constantly fall out of your hanging shower caddy or barely fit on the corners of your tub, put the products into alternate containers. These are often slimmer and have a larger flat surface, which makes it easier to store on a wire rack. Add a label to the bottles so you identify what’s what. That being said, if your precious shampoos, conditioners, hair masks, and face washes are prone to ending up on your shower floor, or worse, splayed across the rim of your bathtub or overflowing in your cabinet storage, consider organizing the space inside your actual shower by adding a chic shower caddy to hold all those goods. A small stool next to your bathtub serves multiple functions in a small space. Use it to hold your reading materials and jewelry while you’re soaking in the tub, then when you’re out, give it another purpose like a spot to perch towels, show off decorative pieces, a seat for when your kids are bathing, or as a way to reach items on tall shelves. If floor space is tight, see if you can tuck it away under the sink or a counter. A reflective bowl on the side of your sink has double the function in a small bathroom. 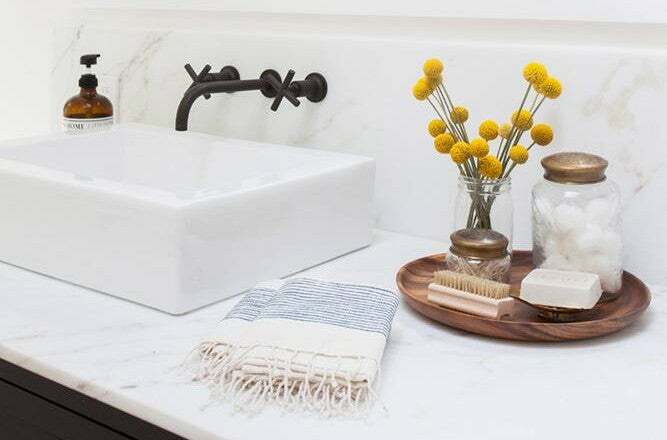 It not only works as a catchall for little items or as a spot to stash jewelry while washing your hands, but it helps bounce light around to make the space feel bigger than it is. Instead of spending your precious morning minutes searching for your favorite lipstick in an overcrowded makeup drawer, upgrade your beauty storage by transforming empty wall space by the mirror into a chic makeup cubby. Your morning routine just gained an extra five minutes. Here’s how to make this DIY cup organizer from A Beautiful Mess that’s a fresh alternative to all those mason jar DIYs and way more stylish than plastic storage bins. Two-tone bathroom walls? Make them work overtime by installing a little ledge that separates the two like molding and extends across the entire width of your wall. You can even have it wrap around the entire room depending on your space. Whether you use it to hold decorative accessories or something more practical like amenities, a slim wall-mounted shelf adds just that little bit of storage space you were missing. Boost your bathtub’s utility by adding a petite shelf behind the tub for your spa-treatment stuff you grab only while you’re soaking. Bath salts, soaps, washcloths, and candles feel right at home here. Think you still need more space? Even if you have your towel storage covered, add a few more wall hooks to make a new home for extras crowding your vanity. We especially love hanging delicate baskets or small canvas bags on the hooks to hold grouped items, like your spa-day products or manicure kit. Natural body scrubbers and sponges can be used like accessories here too. This story was originally published on March 25, 2017. It has been updated with new information.